EAs in the survey come mainly from a set of 5 high-income western populations. The USA’s share of the EA population has decreased over time. The UK has relatively higher support for Global Poverty and lower support for AI Risk than the other main countries. The USA and Canada have a smaller percent of veg*n EAs compared to other large national cohorts of EAs. Continental European EAs countries have particularly high rates of local group membership. 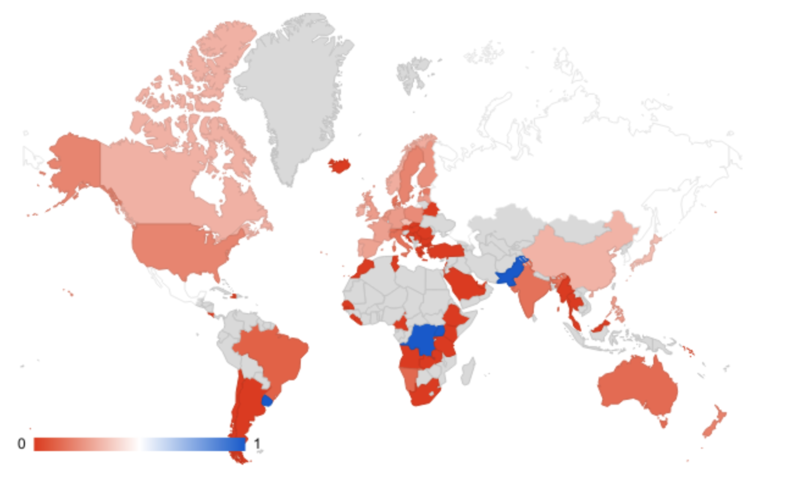 In this post we explore geographic differences in EA across the globe. A plurality of respondents reported being located in the United States (36.33%), followed by the UK (16.19%). It seems worthwhile to investigate if these populations are distinctly different from EAs elsewhere. This may help to point to causes or dynamics in the movement that are being missed to due to the dominance of these two nationalities. 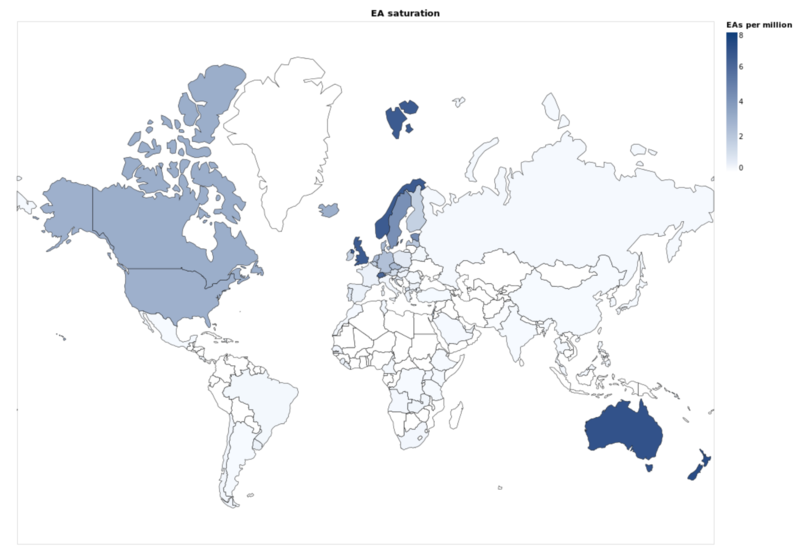 While a large absolute number of EAs in the survey identify the USA and UK as their country, EAs from the UK, Norway, Switzerland, New Zealand and Australia make up a large number relative to their country populations. For the remainder of this post though, we will primarily focus on the US, UK, Canada, Australia, and Germany due to the low absolute number of EAs from other countries. 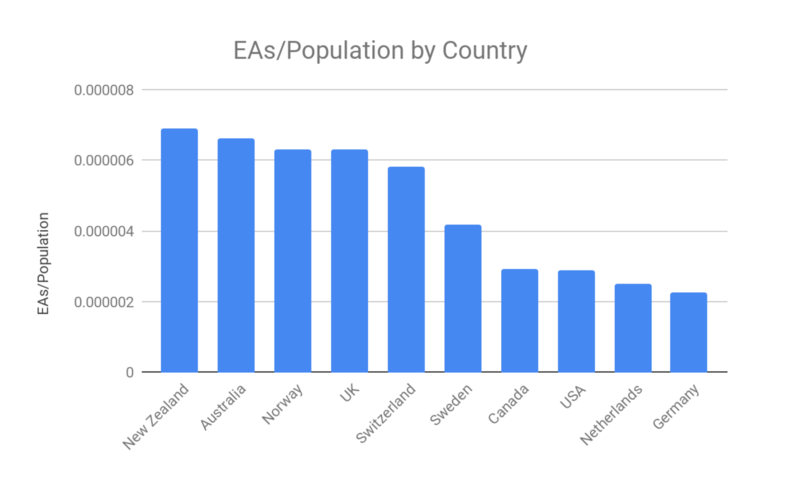 Looking only at the top EA countries (by number of EAs), we can see the number of EAs in a country relative to the population of those countries suggests that the UK has a larger number of EAs comparable to proportions of countries with much smaller total populations. As we identified in a previous post [EA · GW], the most commonly reported location was the San Francisco Bay Area (with 9% of respondents) followed by London (7%) and New York City (4%), though there was an extremely long tail of smaller cities and Other responses. It seemed possible that the diversity of cities that EAs live in might be over-stated though, if many of the smaller cities were essentially just parts of larger cities already captured in the analysis (e.g. respondents might write in ‘Daly City’ which we would count as part of the Bay Area). 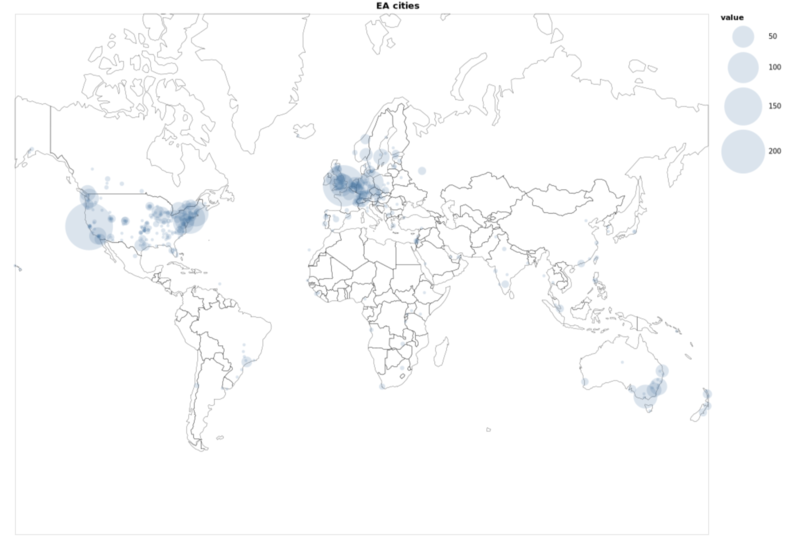 To examine this we manually coded each of cities (other than the major hubs) as to their proximity to another city. This procedure confirmed that only 45/476 cities (9.45%), containing 47 EAs (2.1%) were even vaguely close (within ~50km) to other cities in our list, suggesting that this was not a major factor. 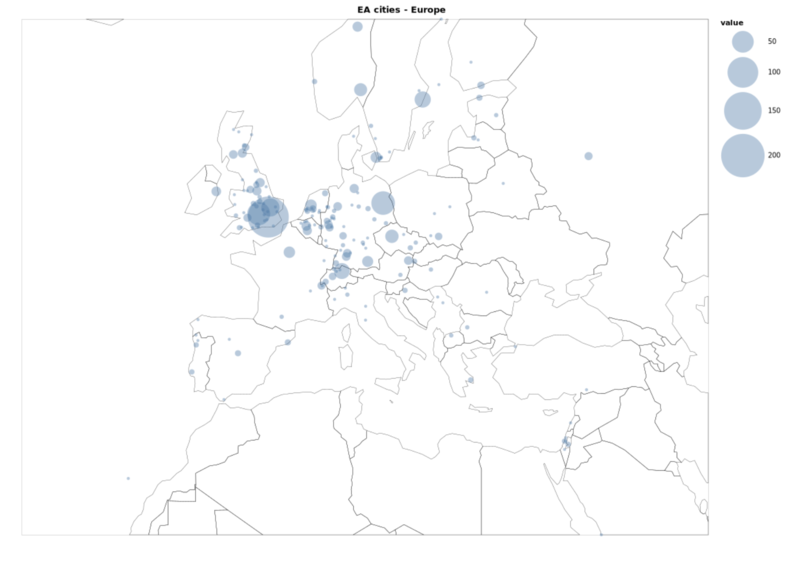 The following maps show the locations of EAs in cities around the world, with larger circles representing greater numbers of EAs. We also examined the number of EAs in a city relative to the population of those cities. Unsurprisingly, by this metric, university cities heavily dominated, with St Andrews, Oxford, Durham, Princeton and Cambridge leading the list. 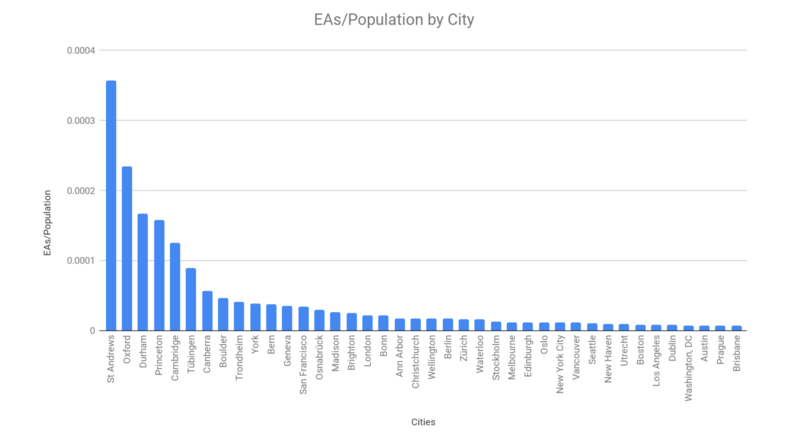 Looking only at the top EA cities (by number of EAs) and capping the y-axis we can compare variation within the major EA cities more easily, which suggests that the San Francisco Bay Area has a large number of EAs (even for the size of the total metropolitan area), as does London. The USA’s share of the movement has been declining as EA gains a more global reach. The USA’s share has declined from 49% in 2009 to 36% in 2018, while the share of EAs coming from countries other than the top 5 has risen from 19% to 25%, and the UK’s share of EAs has risen from 11% to 17%. The shares of Australia, Canada, Germany, Sweden, and the Netherlands have been relatively flat. One reason to be more tentative about these possible shifts is that we only have survey results from those who have remained in EA since they joined. However, given the quite even growth rates, it seems unlikely there is a significant hidden amount of attrition due to survivorship bias. The number of people joining EA per year increased substantially between 2014 and 2015 globally, although not as dramatically for Continental Europe and Australia. 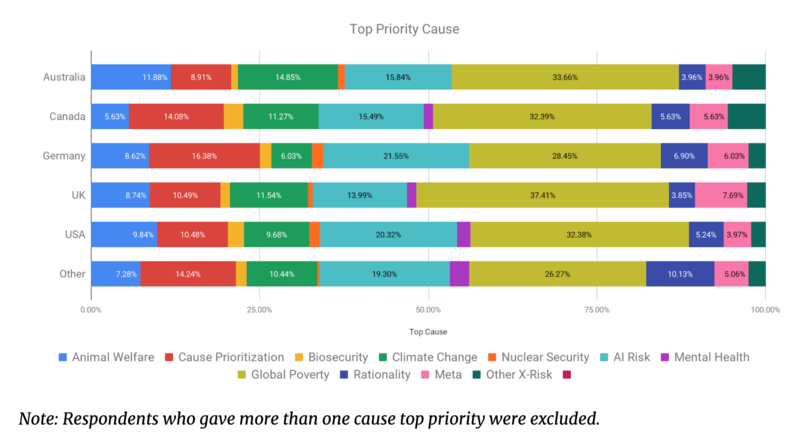 Mirroring the overall findings on Cause Selections [EA · GW], Global Poverty is the most popular cause area globally followed by Reducing the Risks from Artificial Intelligence across each of the main countries. While the USA is sometimes perceived as more concerned with X-Risk/Long-Term Future causes due to the hub of EAs in San Francisco, levels of support for AI among American EAs (20.32%) are similar to those in Germany (21.55%) and the broader Global EA community (19.30%). The UK, by contrast, has a comparatively lower percent of EAs prioritising AI Risks (13.99%). EAs from outside the largest 5 national cohorts have the smallest plurality (26.27%) favouring Global Poverty as a top priority cause and a larger percent of interest (10.13%) in Improving Rationality and Decision-Making. The largest country cohorts in the “other” category are Switzerland, the Netherlands, Sweden, Norway, New Zealand, Czech Republic, France, and Poland (in that order).Within this grouping, EAs from the Czech Republic, France, the Netherlands, and Switzerland prefer Risks from AI to Global Poverty. Australia also has a large percent of EAs (14.85%) who rank climate change as a top priority, making it the third most popular cause among Australians, as it is for British EAs (11.54%). 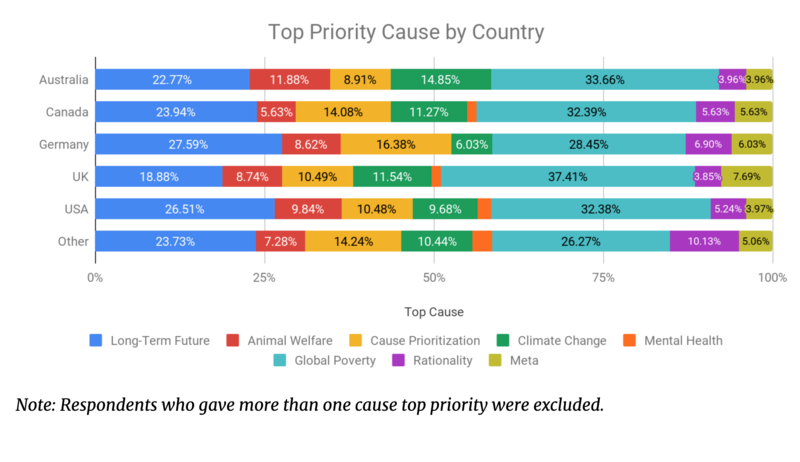 Cause prioritisation receives a large amount of support (16.38%) among Germans, making it the third most popular cause, as it is for Canadians also (14.08%). Combining Long-Term Future causes (AI Risks, Nuclear Security, Biosecurity, Other Existential Risks) we can see that a similar percent of German EAs rank this cause area as high as they rank Global Poverty, while a smaller percent of British EAs rank this cause area as a top priority, compared to other nationalities. 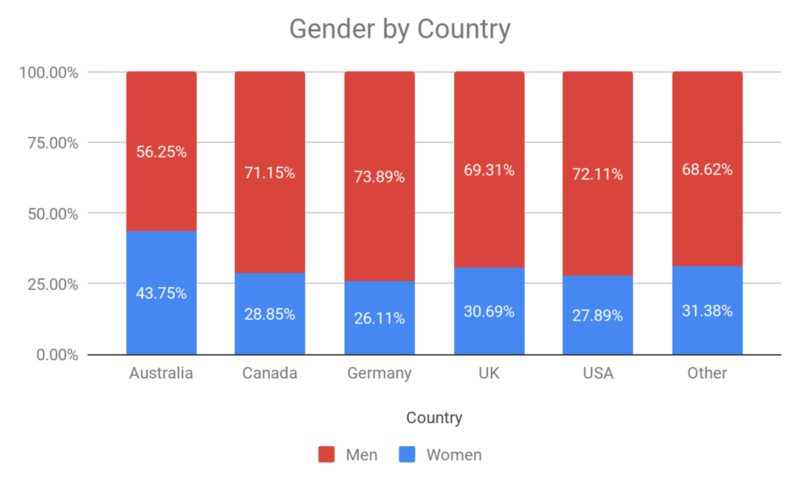 Like the EA survey as a whole, there are more male [EA · GW] than female EAs within the top 5 largest national cohorts, though Australia approaches a more balanced sample and is significantly (p<0.0004) different from the global average. 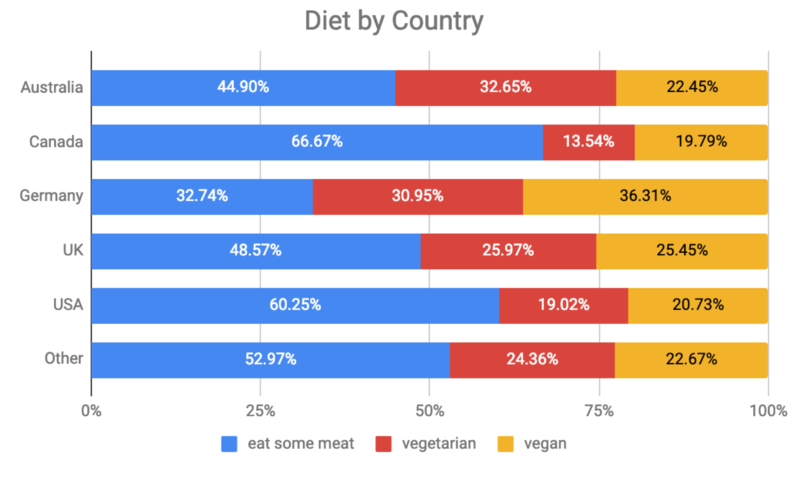 Continental European EAs are more likely to be vegan than other groups, and Germany has a smaller percentage of meat-eating EAs (32.74%) than the continental European average (42.26%). Australian EAs also have a high percent of vegans or vegetarians, possibly due to the influence of Peter Singer’s writings. Perhaps not surprising then that a large percent of Australians (11.88%) rate Animal Welfare as a top priority cause. Canada and the USA stand in stark contrast in this regard with over 60% of EAs consuming meat, though a majority of these EAs report that they are trying to reduce the amount of meat they consume. EAs coming from continental Europe are very often members of local EA groups, with a majority of German EAs (59.59%) being members of local groups. EAs from low-income countries tend not to be, which is not surprising given the low absolute number of local EA groups in these countries. Why American EAs are significantly (p<0.0001) less likely to be local group members is unclear, though may reflect a broader American feature. However, there is variation among the most represented North American cities (San Francisco, New York, Boston, Vancouver). 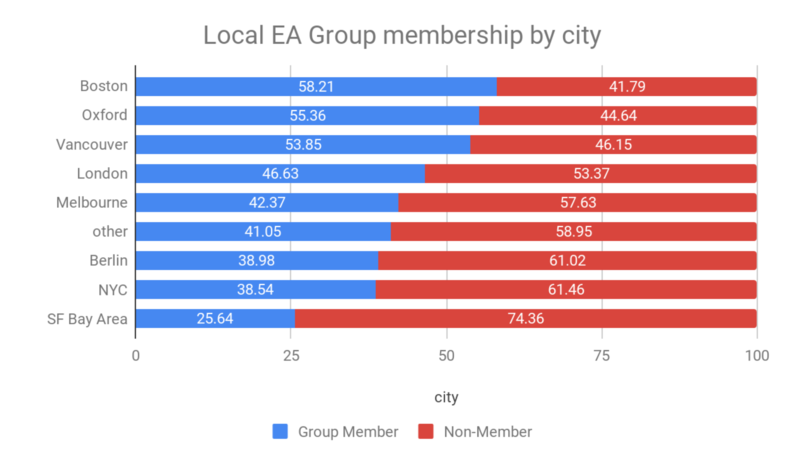 A majority of Boston and Vancouver EAs are local group members while only 25.64% of San Francisco EAs are. Oxford also boasts a majority of local group members among its EAs. 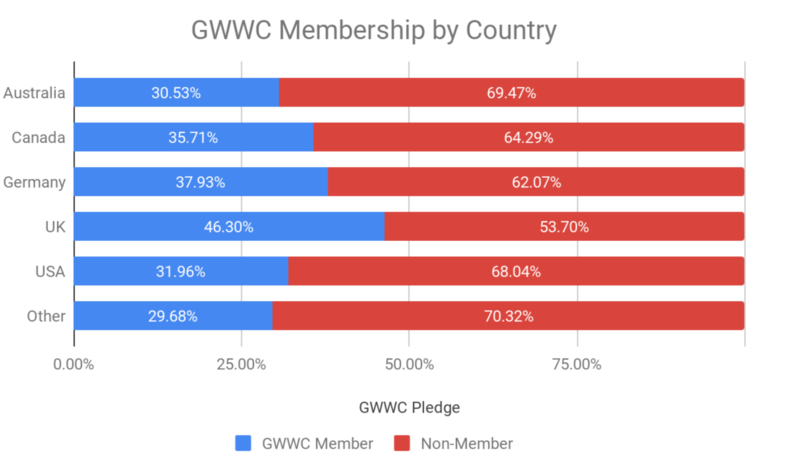 While the majority of GWWC members in the survey come from the USA and UK, all of the (few) EAs coming from DRC, Angola, Pakistan, Saudi Arabia, Bulgaria, Iceland, Liberia, and many from China (8 of 13) are members. Almost half (46.3%) of UK EAs have taken the GWWC pledge and are significantly (p< 0.0001) more likely to be members of GWWC than other EAs. 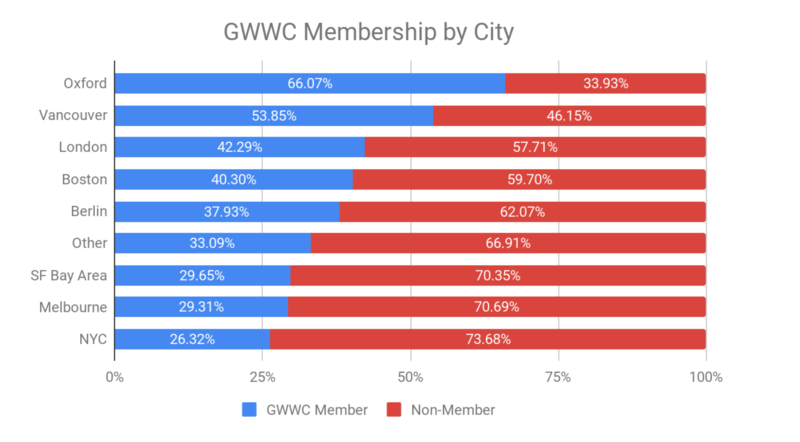 Unsurprisingly, GWWC membership remains strong where it began, being especially high among Oxford EAs (66.07%). 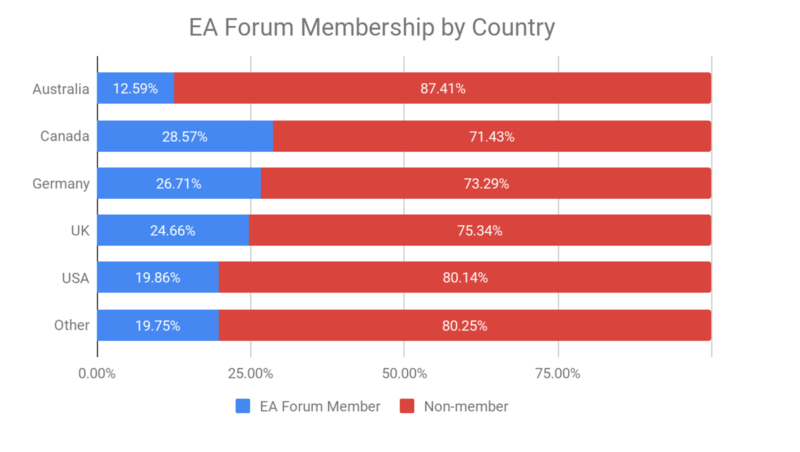 While the majority of EA forum members in the survey come from the USA & UK, all of the EAs from DRC, Uganda, Angola, Saudi Arabia, Pakistan, Bulgaria and Liberia are members of the EA Forum, though there is only 1 EA from each of these countries in the survey. Australian EAs are significantly (p<0.0151) less likely to be members of the EA Forum compared to other EAs. 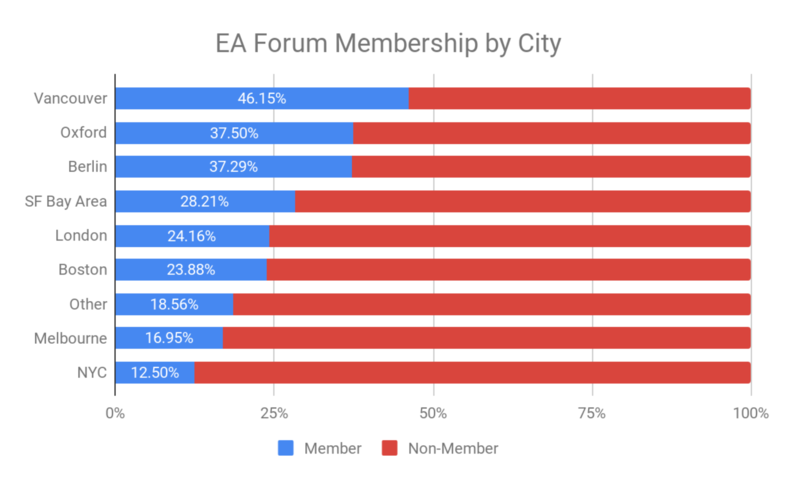 Almost half of the EAs in Vancouver are members (46.15%), while only 12.5% of New York City EAs are on the forum. American EAs make up a plurality of those who are members of both the EA Forum and LessWrong, followed by British EAs. However, the percent of Canadian EAs that are members of both is higher than for other nationalities. That many Australian EAs are not active online, where X-risk topics are popular, may relate to the stronger top priority cause preference for Animal Welfare/Climate Change, and generally, more Global poverty focussed community. There is a statistically significant (p<0.0001) difference between American and other EAs in terms of LessWrong membership (mean of 22.5% compared to 16.7%). The (few) EAs coming from Central/East Africa and South Asia are researchers, and perhaps unsurprisingly there are few EAs in earning to give roles in low-income countries like India and in Central Africa. 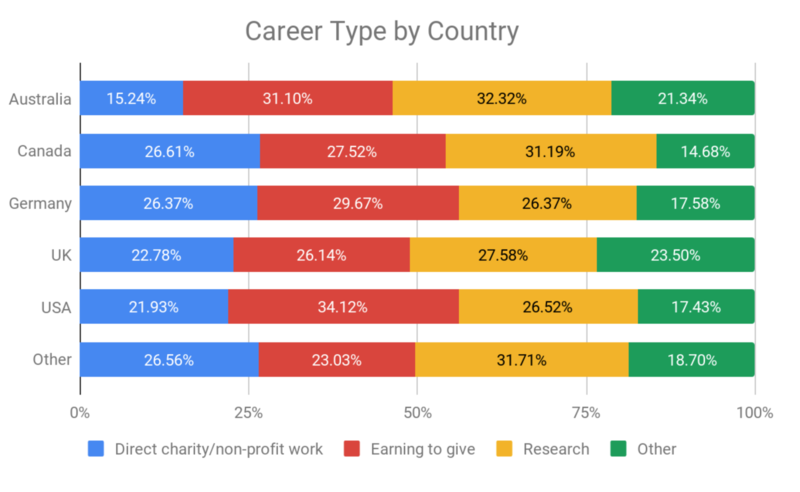 Argentinians, Brazilians and Chinese EAs are often Earning to Give, and Australians are among the least likely to have careers in Direct Work/Non-Profit EAs. 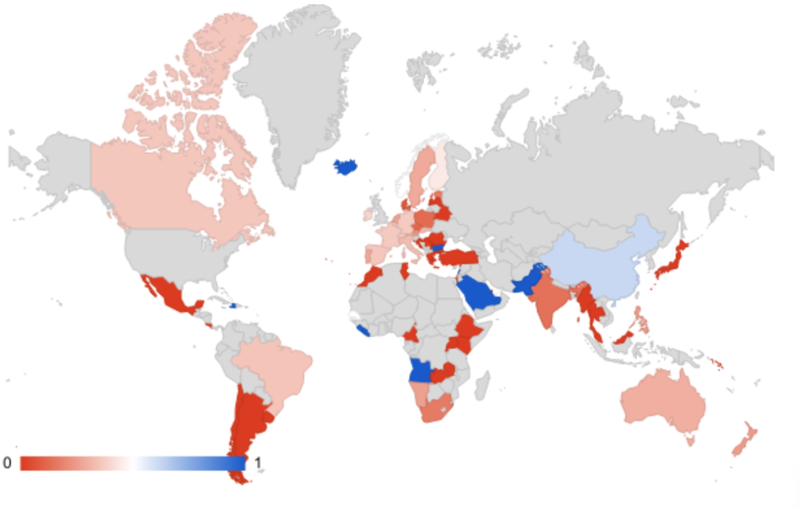 There are no significant differences between countries and career type though. As would be expected, almost half (48.21%) of Oxford EAs are in research careers and few are in Earning to Give roles. 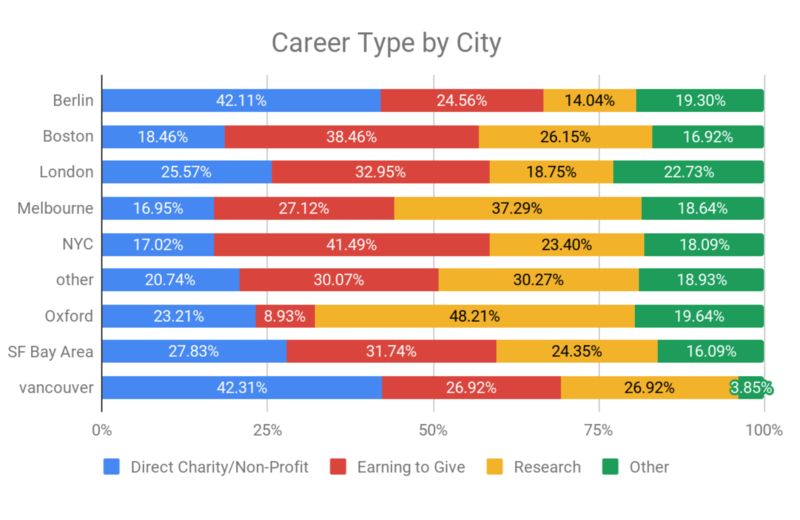 Pluralities in London (32.95%) and New York City (41.49%) are earning to give, while pluralities in Berlin (42.11%) and Vancouver (42.31%) are in Direct Charity/Non-Profit careers. In raw numbers, the USA and UK dominate the EA movement, however, they are markedly different from other nationalities in some respects. American EAs are less likely to be vegan or vegetarian compared to European or Australian EAs, but are more likely to be members of LessWrong, which is positively associated with a higher preference for Reducing Risks from AI as a top priority cause. However, there appears to be a high percent of support for prioritising this cause area outside the USA, especially in Germany where veganism is high. 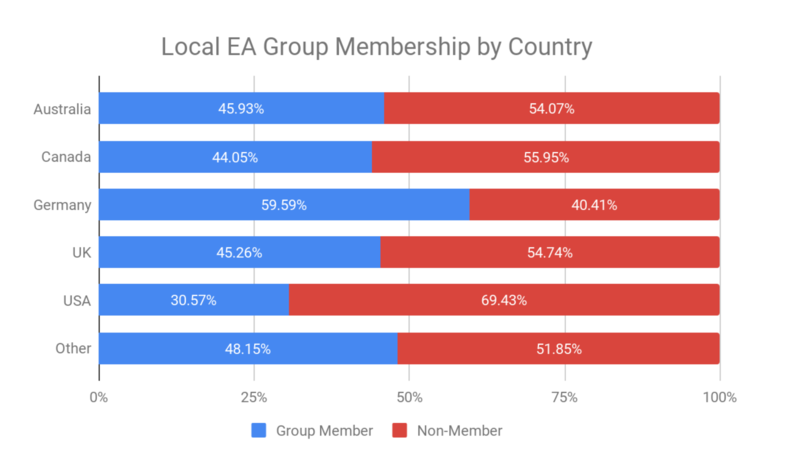 American EAs lag behind their global peers in terms of local EA group membership, which has been growing [EA · GW] overall. Australian EAs appear to be less active online, even though they don&apos;t seem to be especially disproportionately new EAs who we might expect to be less familiar and involved with online groups. Similarly, female EAs, who we found to be less highly represented [EA · GW] in online groups, make up a bigger share of Australian EAs than in other countries, however male Australian EAs are also less likely to be EA forum members than other nationalities. This post was written and with analysis by Neil Dullaghan, with contributions from David Moss and Kim Cuddington. Thanks to Marcin Wosinek for contributing data visualisations and thanks to Marisa Jurczyk and Ida Sprengers for data processing and research assistance. The annual EA Survey is a project of Rethink Charity with analysis and commentary from researchers at Rethink Priorities. Thanks for the new post -- I'd thought the series was over, and it's fantastic to have even more data (plus charts!). I'm confused by the group layout in North America. 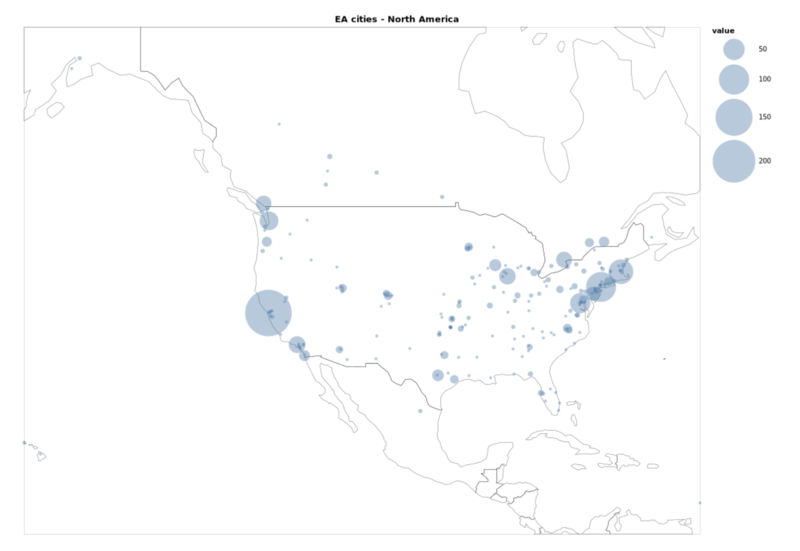 It portrays a large group of EAs somewhere in southern California, with no large group in the Bay Area, which doesn't match the data tables in the post. Were some of the circles misplaced? 2. what was there in the data as 'SF Bay Area' was merged to 'San Francisco'. I've no idea how good assumption was that. 3. The small dots in California are for Oakland, San Jose, Berkley, Concord + few more. Glad you enjoyed the post, we have a few more supplementary posts coming out. In the North America-only map there is a large circle over a wide "Bay area" (approx. Redding in the top & Santa Maria in the bottom of the circle), with a small point on San Francisco itself near the centre. In the World Map there is a small point on San Francisco itself, and medium circles over LA/Southern California which are all encompassed within a larger "West Coast" circle.